Shallots are a variety in this species. Scallions are a different species, Allium fistulosum. Common Names: “onion”, including all cooking varieties: yellow onion, Spanish onion, red globe onion, white onion, sweet onion. Distribution and Habitat: Onions are cultivated globally in a wide range of climates. China, India, and the United States are the world’s top producers of onions, mostly for domestic consumption. Egypt is the top onion exporter and other countries in the Middle East are significant producers. Allium cepa is unknown in the wild but historians believed that the onion originated in Egypt. There are no palaeontological clues to determine the geographical origin of the species. Some botanists speculate that it has been cultivated for at least 7,000 years and originally derived from a wild species in western Asia. 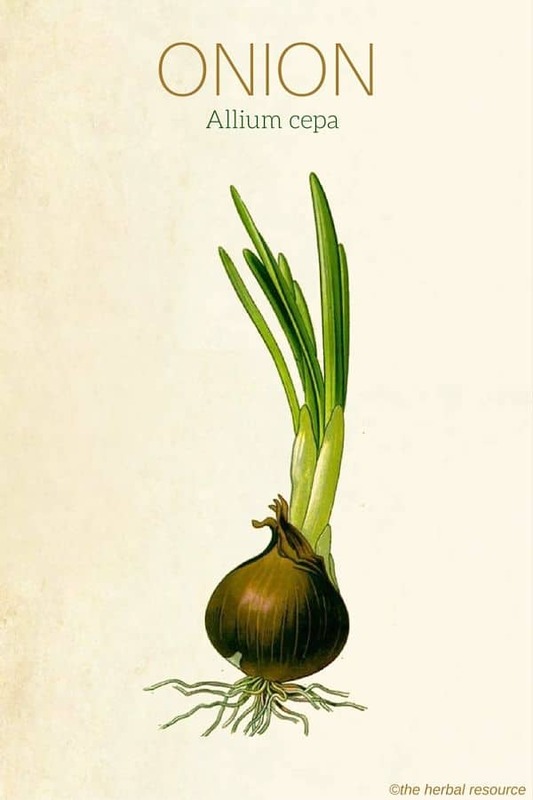 Plant Description: The onion bulb, used in cooking, is familiar to everyone. The different varieties within the species vary in color, size, and taste. 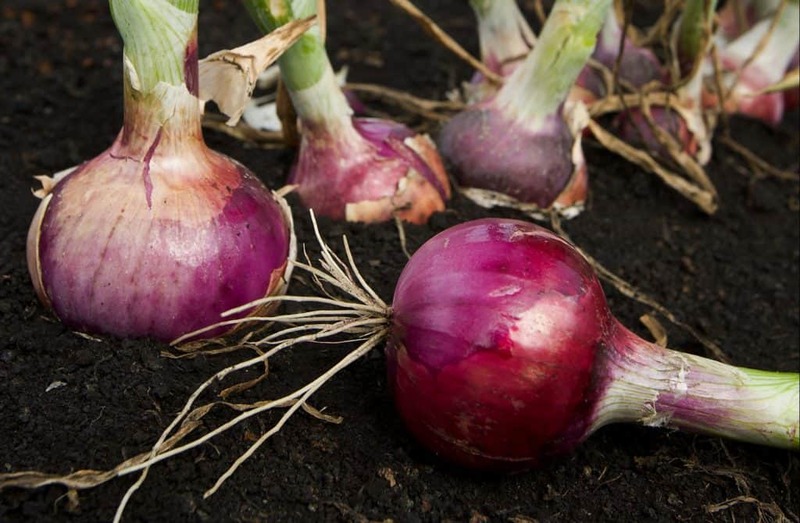 It is the sulfur compounds in the bulb that give onion its characteristic flavor and smell. Like all alliums, the onion will produce a green shoot when the bulb ages, whether or not it is placed in the ground. If planted, this shoot will grow to produce stems and leaves, which are long and hollow. The floral stem produces a ball of small white flowers, similar in appearance to many other alliums. As a crop, it is usually harvested at the end of the first year. Plant Parts Used: The medicinal compounds are found largely in the bulb. Herbal medicines are made from the dried bulb, crushed into a powder, although there is some value in eating the onion itself, especially raw. Some recent studies have found adequate concentrations of bioactive compounds in the young stem as well. Onion Plant (Allium cepa). Attribution: United States Department of Agriculture. The use of onion as a medicine is worldwide and the health problems it is claimed to treat are numerous. According to the World Health Organization the health problems for which onion is used as a folk remedy include: bruises, colic, ear-ache, bronchitis, colds, fevers, intestinal parasites, high blood pressure, jaundice, sores, and impotence. Add to this list of conditions a number of others documented by the botanist James Duke in his long career in ethnobotanical research: cataracts, heart disease, burns, scabies, tuberculosis, insect stings, high cholesterol, and even varicose veins. In addition to these uses documented in traditional medicine, this herb has also been investigated as a possible modern medicine for the treatment of diabetes, HIV and cancers. Can the humble onion really treat all of these health problems? 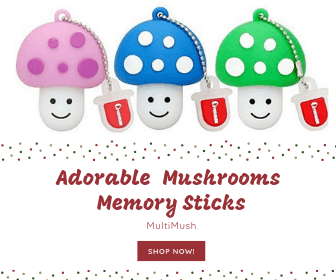 Some sense can be made of this voluminous list of medical conditions if they are grouped into categories corresponding to several general modes of action of medicines. The fact that onion demonstrates several different modes of action is largely due to the fact that onion contains several flavonoids, notably quercetin, which has multiple biochemical properties: antibiotic and antiviral, anti-inflammatory, and cell signaling. In addition to the flavonoids, it contains numerous organosulfur compounds and these also have medical properties. Onion’s use as an antibiotic has been confirmed in laboratory studies showing action against some of the most common and potentially dangerous bacterial infections, including E. coli, and strains of Streptococus and Salmonella. The antibacterial agents in the onion are believed to be natural organo-sulfur compounds, especially thiosulphate. Essential oils from onion are also active against a variety of fungal infections, including Candida. Overgrowth of this naturally occurring yeast results in problematic infections of the skin and urinary and digestive systems. Both onion and garlic compared well with synthetic anti-fungal medicines in combating twelve different strains of Candida. However, these studies are in vitro and not clinical trials, i.e., tests on humans. Onion extract is a known as a blood anticoagulant. The anti-clotting effect of onions and other alliums (such as garlic) is linked to their high content of organo-sulfurs. This makes it a good herbal remedy to help treat some cardiovascular conditions. Interestingly, it appears that the anticoagulant properties do not exist in raw onion but are there in processed onion such as powders and soups. Some chemical changes might take place in drying or cooking the onion bring out the anticoagulants. Onion’s ability to regulate blood sugar is supported by clinical evidence since the 1970s. In an Indian study of early-stage diabetic patients, those who ate more raw onion required less antidiabetic medication to manage diabetes. What is interesting about the onion diet is that there is a beneficial lowering of blood glucose without any loss of essential blood lipids. The base of the flower (callus) rather than the bulb may, in fact, have more anti-diabetic compounds and in higher concentrations. The field of anti-oxidant and anti-inflammatory medicine is expanding rapidly as it becomes more apparent how many diseases have inflammation signaling as their root cause. At the same time, more medicinal plants are being examined for their anti-inflammatory action. 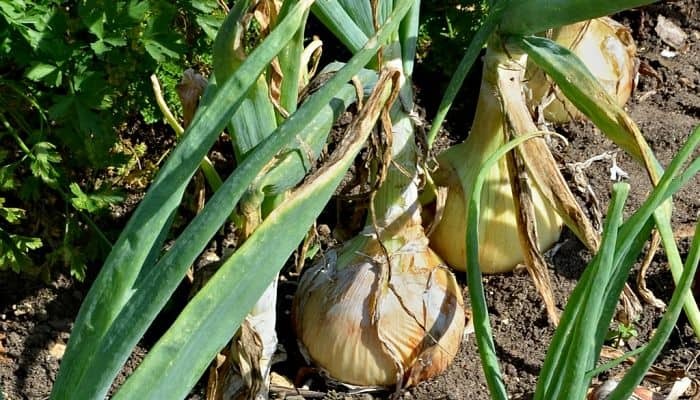 Medicinal plants with high concentrations of anti-inflammatories, such as onion, can therefore be expected to have an effect on health problems as varied as asthma, arthritis, bronchitis, and simple allergies and rashes. In onion, the anti-inflammatory agents identified to date are the flavonoids, specifically quercetin and kaempferol, which inhibit several inflammation-signaling enzymes and histamine. Skin allergies, as well as bronchitis brought on by allergens, have in fact been successfully treated with ethanol onion extract. Building from earlier studies on the anti-inflammatory properties of onion compounds, cancer researchers are now looking closer at the flavonoids as well as the natural sulfur compounds in onion, and testing these for their potential to kill cancer cells. The research focus currently is on stomach and colon cancers. Biochemists believe that the anticancer activity of onions and other alliums may be due to the chemicals that arise from the breaking down (through chopping, cooking, or dissolution) of the organosulfur compounds in the raw bulb. In particular, S-alk(en)yl cysteine sulfoxide, a free radical scavenger, is inhibiting mutation of DNA. The antimutagenic effect of this herb is not restricted to special preparations in the lab. A simple meal of fried onions and cherry tomatoes or fried onions alone was shown to reduce the number of damaging DNA breakages in the lymphocyte cells of healthy young women. The precise chemical mechanism is unknown but is probably related to the antioxidant behavior of the flavonoids in onion. Because onions are so liberally used it is difficult to find a recommended dosage and to convert this to the quantity of onions to be eaten. There are as yet no Commission E recommendations. However, the great wealth of information on onions, both from homeopathic practitioners and clinical researchers, indicates that onions, both raw and cooked, are an important part of a health-promoting diet. Powdered onion (Allium cepa) is sold commercially in capsule form. It is typically marketed as an antihistamine and cold medicine. The capsules come in different homeopathic potency levels: 1X, 30C, 200C, 1M, and 10M. The 30C level is generally considered the “middle of the road”. As with all herbal remedies, one should always consult a professional herbalist or medical doctor before taking stronger potencies. Onion juice is also used in naturopathic medicine. It is prepared simply by putting the peeled raw onions into a juicer. It is used by some herbalists to help soothe skin afflictions. Warmed onion juice is also poured into the ear to cure earaches. This is not recommended without first consulting a doctor to determine the cause of an earache, as there might be a serious condition that could be worsened by the introduction of foreign liquid. Ethanol and other alcohol extracts are other forms of medicinal onion but these are only used in laboratory experiments and clinical practice. Because it is such a commonly used food around the world, onion is considered generally safe, especially if the whole bulb (rather than concentrated powder) is consumed. However, the fact that onion is such a common food does not mean that there are not some side effects when it is used as an herbal remedy. Reactions such as contact dermatitis, bronchial asthma, and inflammation of the nose membranes have been documented. Those who do not eat onion or garlic because of allergic reaction should not take the commercial capsules either. Anyone on blood-thinners or other medicines for high-blood pressure should consult a medical doctor before significantly increasing their intake of this herb or taking prepared forms. WHO Monographs on Medicinal Plants. Arunachalam, K. Antimicrobial activity of garlic, onion, and honey. Geobios, 1980, 7:46–47. Shams-Ghahfarokhi, M., M. R. Shokoohamiri, N. Amirrajab, et al. In vitro antifungal activities of Allium cepa, Allium sativum and ketoconazole against some pathogenic yeasts and dermatophytes. Fitoterapia. 2006, 77(4): 321-323.
induced hyperglycemia in man. Indian journal of medical research, 1977, 65:422–429. Tjokroprawiro, A., B. S. Pikir, A. A. Budhiarta, et al.Metabolic effects of onion and green beans on diabetic patients. Tohoku J. Exp. Med. 1983, 141 Suppl: 671-676. Kelkar SM, Kaklij GS, Bapat VA. Determination of antidiabetic activity in Allium cepa (onion) tissue cultures. Indian J Biochem Biophys. 2001, 38(4): 277-279. Middleton, E. The flavonoids. Trends in pharmacological sciences (TIPS), 1984, 5: 335–338. Breu W, Dorsch W. Allium cepa L. (Onion): Chemistry, analysis and pharmacology. In: Wagner H, Farnsworth NR, eds. Economic and medicinal plants research, Vol. 6. Boyle, S. P., V. L. Dobson, S. J. Duthie, et al. Absorption and DNA protective effects of flavonoid glycosides from an onion meal. Eur. J. Nutr. 2000, 39(5): 213-223. Valdivieso, R. et al. Bronchial asthma, rhinoconjunctivitis, and contact dermatitis caused by onion. J. Allergy Clin. Immunol. 1994, 94: 928–930. You might be interested to know that we in S.E. Arizona have wild onions growing here which could have been used to produce other varieties of onions.